4 years ago ago by Old Parkonians.Members of the Cricket Section attended the Cheshire Cricket Alliance Presentation dinner and were pleased to once again be presented with the Umpire's prize for sportsmanship, for the second year running. Whilst this does not make up for the disappointing results on the field during the season, it does show our Club in an extremely good light and goes to prove that our Club is the most welcoming in the league to officials and opposition alike. 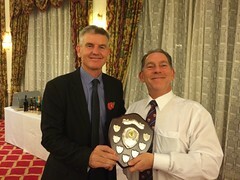 The photograph shows Cricket Chairman Stewie McEwen being presented with the award by Peter Bowler, ex county cricketer, who was the guest and after dinner speaker at the awards ceremony. Whilst thanks should go to all of those who played this year for their sportsmanship, special mention should also be made of Richie Beckett who always goes the extra mile to welcome and entertain officials each week. The curtain came down on the Cricket season when on Friday 19th September the club held it's Presentation Dinner. The new formula proved a hit as over 50 players, partners and families attended. It has been a difficult season in terms of results but the new sense of optimism within the club ensured a great turn out and the evening proved a resounding success. Members were joined by guests Ted Keaney and Steve Kearney but Dave Westwater was unable to attend due to a previous engagement. Master of Ceremonies was Terry Marnick. Myles Allen was the recipient of this seasons 'Duck Bat'. The following evening the Juniors gathered at the club for their Presentation. Well done to all concerned but never lose sight of the fact that it's a team sport and requires a team effort! The final game of the season saw the visit of title contenders Port Sunlight to Holm Lane seeking a victory to give them a chance of pipping Eastham to top the division. Port Sunlight skipper John Roberts won the toss and elected to bat as the sun shone brightly. Stew McEwen (12-1-46-1) broke the opening partnership with the score on 24 when he bowled B Parsons (11), but the visitors would add another 46 runs before the fall of the second wicket. Ben Rees (15-2-69-2) offered up a ball that A Jones (15) couldnt resist and Old Parks skipper David Buey made good ground to take a fine catch at deep mid off. M Parsons (54) and D Jones (76) took the score to 140 for 3 with Rees claiming his 2nd wicket of the afternoon bowling Parsons. 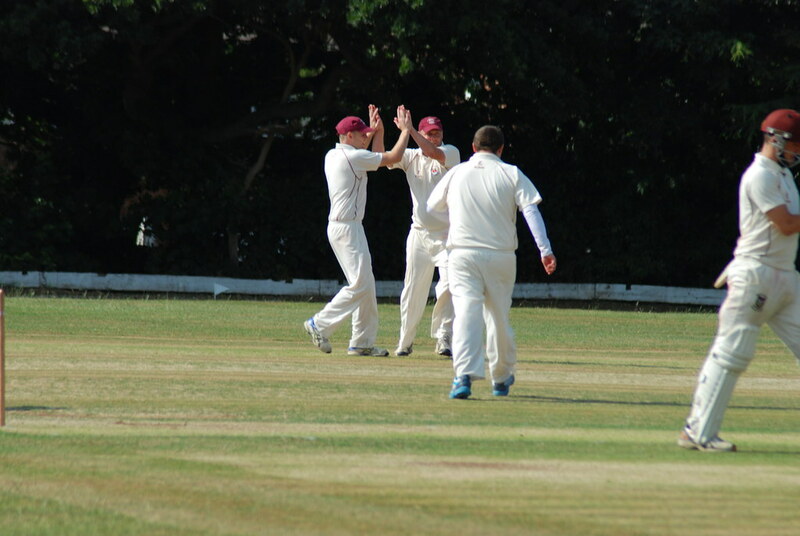 Mark Rayner (7-1-37-3) got both B Nuttal (2) and M Warhurst (8) LBW and then Carl Brannon reacted well to stump Jones off the bowling of Sean Marnick (4-0-27-1). Brannon again claimed the stumping of John Roberts (9) off Rayner to leave Port Sunlight on 209 for 7 and the home side expecting a declaration. Liam Westwater (1-0-8-1) claimed the scalp of J Hughes (7) thanks to a catch in 'cow corner' by the ice cool David Nedugodan and shortly after the visitors did declare on 234 for 8 off 44 overs leaving the home side with a mammoth task. The early afternoon sunshine had all but disappeared after the tea interval and the weather took on a distinctly autumnal feel. Old Parkonians task got harder when they lost opener Brannon (1) bowled by M Hulley (7-1-16-1) and Terry Marnick (2) to a ridiculous run out with just 8 runs on the board. John Orr (22) steadied the ship and in doing so bought up his 500th run of the campaign assisted by Rees (25) but the mini recovery was short lived as the middle order capitualted. The home side went from 57 for 3 to a miserable 66 for 9 in double quick time. Nedugodan (2), Westwater (1) and ducks for Rayner, Marnick and Buey capped a miserable 10 minute spell. Ben Thomas offered some resistance with a disciplined 22 before being bowled by J Warburton (10-1-24-1). Hughes (8-0-31-4) and Roberts (6-1-17-3) completed the visitors bowling whilst McEwen (1) remained unbeaten. And so the curtain comes down on a difficult but nonetheless enjoyable 2014 season. Team: Brannon+, Orr, Marnick T, Rees, Nedugodan, Rayner, Marnick S, Thomas, Buey*, Westwater, McEwen. An unbeaten 68 from John Orr and a quite simply brilliant performance in the field from Robbie Barr were the backbone of a fine result against promotion hopefuls Mellor. A dark and wet afternoon in the Peak District meant the game started late and was reduced to 40 overs per side. Mellor Skipper Nick Marsland won the toss and put the visitors into bat on the damp track. It had been a close encounter when the sides met at Helm Lane back in June and it would be the same again this time around. Old Parkonians got off to a solid start with Orr and David Nedugodan (16) putting on 42 for the first wicket before Nedugodan went for one big hit too many and was caught by Driver at deep 'Mid Off' off the bowling of Marsland (15-2-52-2). Mark Rayner (5) endured a difficult few overs before being caught by McAllister giving Smith (15-2-45-1) his only wicket of the afternoon. Terry Marnick (15) and Orr pushed the score along to 96 when Marnick was comfortably run out following a good piece of fielding by Bennet at 'Square Leg'. 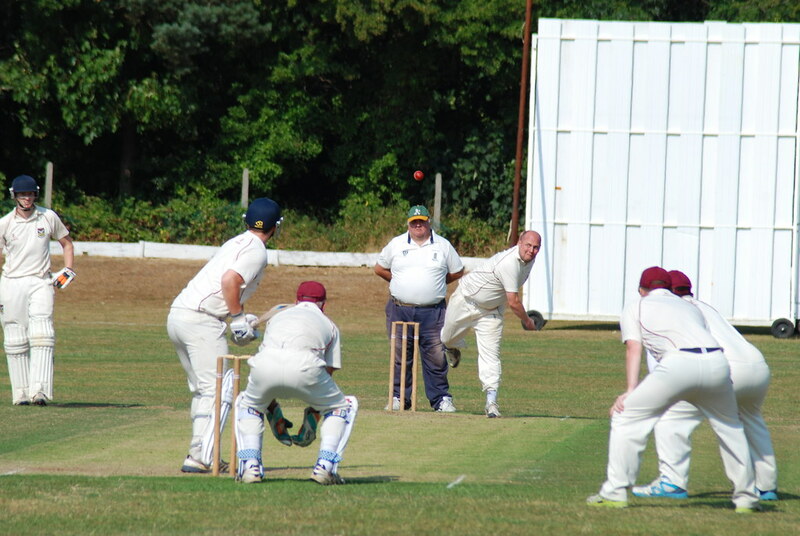 Ben Rees (15) could not quite match the score from his previous outing and with the visitors at 126 for 5 and the wickets of Barr, David Buey and Sam Cotgrave falling without troubling the scorer the additional batting points for reaching 150 seemed a long way off. Orr plugged along comfortably and a quick fire 14 from Sean Marnick eased the total into the 150's as Marnick became Harrison's (9-0-40-4) fourth victim of the afternoon. Alexa Harrison (1) was run out but Stewie McEwen (1 no) defended the final wicket to leave Old Parkonians on 154 for 9 at the close of the innings. 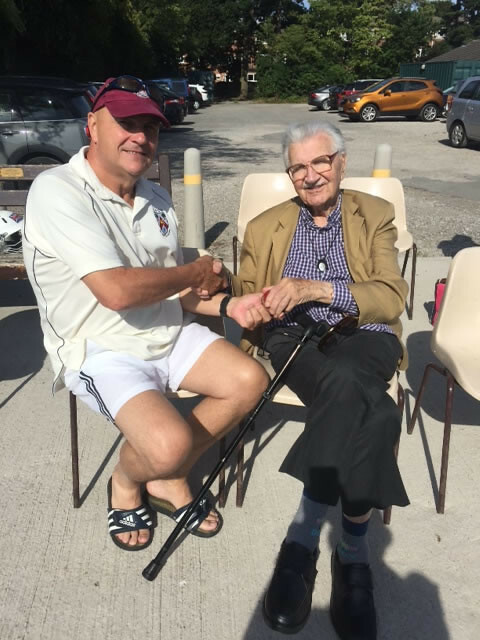 It had taken the home side over 3 hours to bowl their complement of 40 overs and as the sides retired for tea it was clear that the light would have a part to play as Old Parks took the field. Last time out Mellor had 112 on the board before losing their first wicket but it was to be a different story this time around. McEwen (15-3-46-1) took the wicket of Bennet (7) as he looked to go big and when Buey run out Stephenson (16) courtesy of a fine pick up and throw from Barr the home side forund themselves at 26 for 2 and in unfamiliar territory. Runs were difficult to come by for Mellor as time and time again their efforts were thwarted by superb work in the field and at the drinks break they had managed just 42 runs from 20 overs. Rayner, back peddling, caught Harrison (20) off Rees (15-1-49-1) and then Barr capped a quite superb afternoons work in the field taking a superb catch to despatch the big hitting Smith (43) off the bowling of Rayner (5-0-16-3). Rayner was in the thick of it again this time benefitting from the safe hands of Nedugodan to see of Marsland (23) as he threatened briefly to get the run chase back on track. Sean Marnick (5-0-24-2) had McAllister (1) LBW and then bowled Last (10) as the sun disappeared over the horizon. Rayner completed a great spell of bowling obliterating the wicket of Freeman (1) to leave the home side on 137 for 8 as the game drew to a close in almost complete darkness and the visitors just unable to claim those elusive last couple of wickets. 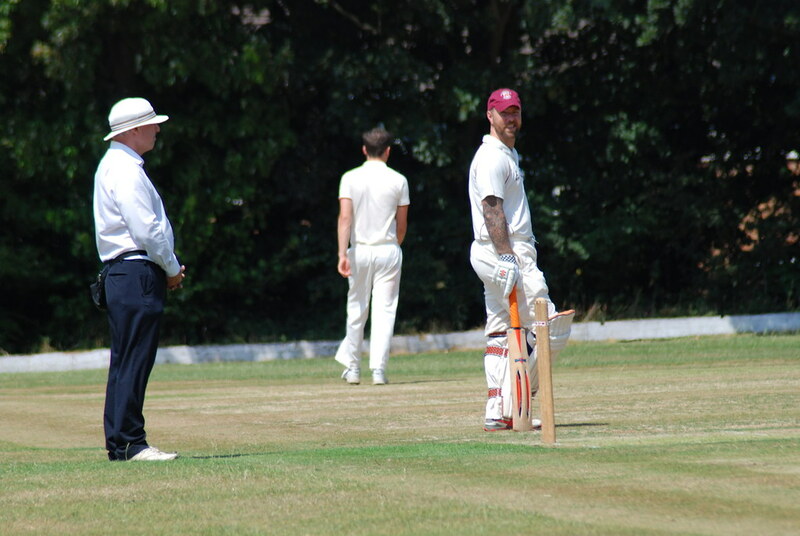 A second wicket stand of 130 between John Orr (50) and Ben Rees (80) secured what, earlier in the day, had looked like an unlikely draw for Old Parkonians at Kerridge. The visitors won the toss and elected to field on a damp track and what would prove to be a lightening fast outfield. Adam Winstanley (15-5-93-2) opened up with three maidens whilst at the other end Orr (7-0-48-0) found the going tough as Roberts (88) picked up bounderies with consumate ease before falling to Winstanley courtesy of a fine catch in the deep by Rees. Grimes (30) led a charmed life with almost all of his runs frustratingly coming off the edge of the bat but he and Capper (36) eased the home side to 152 when the roles were reversed Winstanley catching Grimes off Rees. 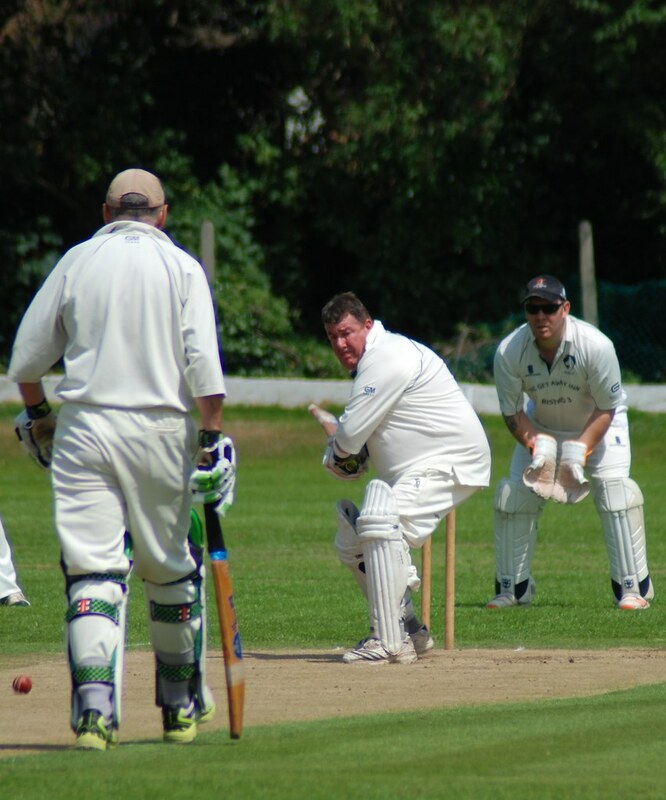 Capper followed soon after caught Alex Tucker off debutant Graeme Troup (6-0-46-2) and Rees was in action again taking a superb diving catch at mid on off Troup. Paul Walker was having a fine debut behind the stumps and was unlucky not to have been rewarded with at least one stumping. Rees (15-2-93-2) despatched Luke Wild (45) with a caught and bowled thereby claiming a 'hatrick' of caught dismissals. With the home side at 226 for 6 off 38 overs Old Parks Skipper David Buey was expecting a declaration but amazingly it never came and that decision was to prove critical. Regan (36 no) and Grayston (40 no) added 72 in the last 8 overs as the visitors bowling was put to the sword. Kerridge finished their innings on 298 for 6 off their alloted 45 overs. It appeared an almost insurmountable task as Orr and David Nedugodan opened the batting after tea. Nedugodan making his debut got off to a fine start before gloving the ball to wicket keeper Wild for 6 off Banks (6-1-22-1). Rees entered the frey in the second over and the fightback began. The overs ticked by whilst Orr and Rees occupied the crease in a disciplined manner, taking their chances when they could. Rees clocked up 15 fours on his way to a career best score whilst Orr chipped in with 8. As Orr reached his half century a momentary lapse of concentration saw him run out by a quick thinking Wild with the score on 137 and 6 overs remaining. 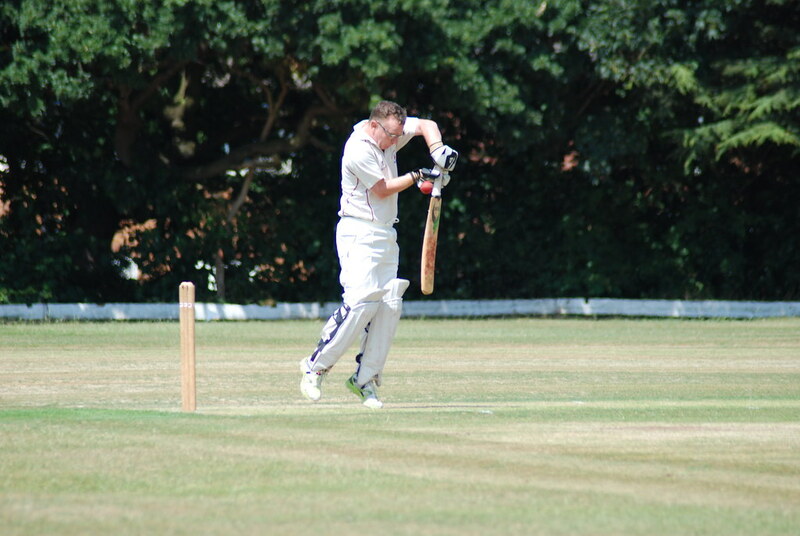 Now revitalised Kerridge crowded the bat of incoming batsman Winstanley (6 no) but he held his nerve. In desperation the home side changed keepers seeking to force a collapse in a game that was now looking increasingly like a draw. Rees finally gloved the ball to Regan bringing to end a fine innings made better by the fact that he was nursing a heavily bruised thumb from earlier in the game. Buey (12 no) and Winstanley frustrated Kerridge for the remaining 4 overs taking Old Parkonians to 167 for 3 at the close of play. In choosing to bat for the full 45 the home side had denied themselves an additional 7 overs or so to skittle out their opponents and Old Parkonians were full value for securing a draw. Team: Orr, Nedugodan, Rees, Winstanley, Buey*, Walker+, Tucker, Williams, Harrison, Troup J and Troup G.
Old Parkonians returned to winning ways with a home victory over Appleton 2nds and a 'Man of the match' performance from Ben Rees. Winning the toss Skipper David Buey put the visitors into bat and threw the new ball to Alex Tucker (7-2-15-1) who responded by taking the wicket of Mannion courtesy of a catch by Rees whilst at the other end Stewie McEwen (15-7-26-3) had Nesbitt on the back foot and he hit his own wicket leaving them 13 for 2. Rees (13-2-32-5) dismissed Arnold LBW, Ryan caught Buey and McEwen bowled I Rashid to leave Appleton at 41 for 5 at the drinks interval. When Rees had Ralston, caught Tucker, then bowled Webster and McEwen took the wicket of S Tomlinson thanks to a fine catch by Terry Marnick at slip it looked to be all over for the visitors with them reeling at 53 for 8. 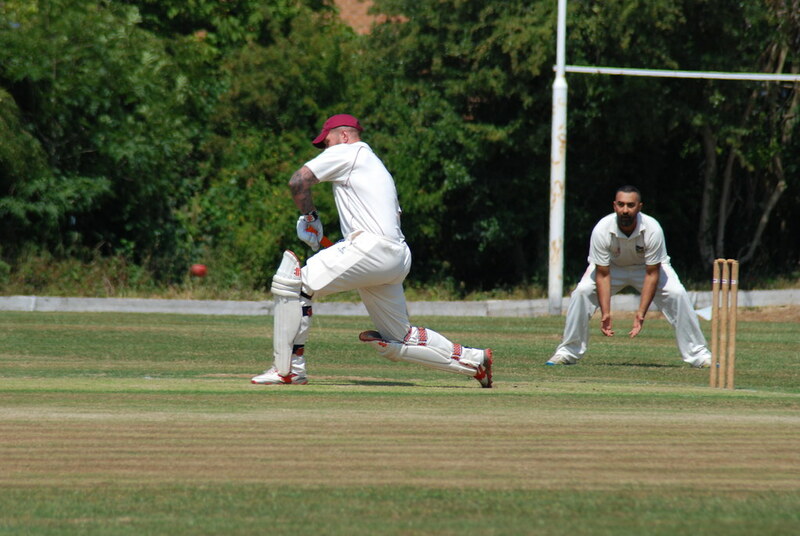 A Rashid (30 no) offered some resistance but when Rees got Cumberland caught Robbie Parr on his debut for his fifth wicket he was running out of partners at 78 for 9. The tenth wicket partnership however took advantage of all the luck that came it way as it appeared to have more lives than a cat. Sean Marnick (2.2-0-13-1) had both Rashid and C Tomlinson out in the same over only for both deliveries to be ruled 'No Balls', Buey put down a difficult catch off the bowling of Sam Cotgrave (6-0-18-0) and then Marnick dropped Rashid off his own bowling allowing the pair to add 33 frustrating runs to the total. Marnick would have the last laugh though as he took the final wicket with a quite simply stunning caught and bowled dismissing Tomlinson with only four balls of the innings remaining thereby affording the home side maximum bowling points. Old Parkonians reply suffered an early setback when Carl Brannon (7) was suprised by the slower ball giving Cumberland (6-1-18-2) a 'caught and bowled' and John Orr (13) was caught by Ralston at deep 'Mid Off' also off Cumberland leaving the home side on a jittery 30 for 2. Dave Roscoe steadied the ship with a well constructed 40 as Marnick T (7) and S Marnick, played on for a duck, off Tomlinson (7-3-23-1) fell in quick succession to leave Old Parks at 50 for 4. Rees (23 no) and Roscoe added 45 for the fifth wicket when the latter was caught by Ralston off the bowling of A Rashid (8-3-17-1). For the second time in 3 weeks Rees and Buey (10 no) eased the second string past the target with four overs to spare. Team: Brannon, Orr, Roscoe, Marnick T, Marnick S, Rees, Buey, Barr, Cotgrave, Tucker, McEwen. An excellent first team game at home Wistaston won the toss and chose to bat first, very well fielded by the whole side taking 8 catches, a stumping and a run out. Well bowled everyone as well Timmy Tim Hitchell 2 for 27 off 10 overs Dan Berkson 2 for 22 off 8 overs. Craig Hawthorne 3 for 30 off 8 overs Adam Westwater 2 for 55 off 10 over and Chris 'Spudge' Beckett 0 for 33 off 8!! Wistaston finished up 170 all out. Old parks innings good start by the two brothers Nick Hitchell 25 Tim hitchell 48 followed up by craig Hawthorne Greg Greg Lindop and Ian Smith adding 40. Then Adam westwater followed up with 19 and Mike hitchell 29 not out and also Adam Winstanley 4 including the winning runs!! Well done boys a big 25 pointer!!! Let's take it to next week!! Old Parkonians made the short trip to Eastham looking to build on the win the previous week. Winning the toss and batting first they suffered an early setback with both openers Carl Brannon (Stumped by Ashton) and Terry Marnick (LBW) back in the pavillion with just 16 on the board and when the in form Mark Rayner 'played on' the signs were ominous with the visitors reeling at 22 for 3. 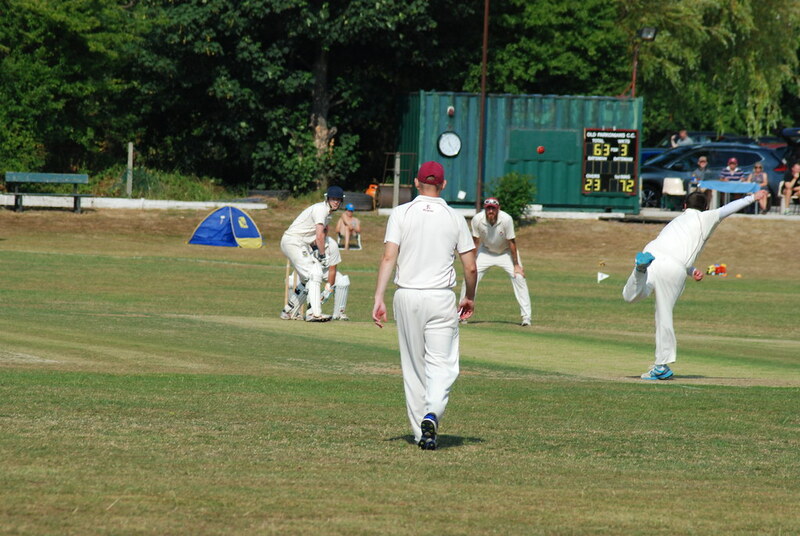 Andy 'Minnie' Moxley (46) came to the crease and settled the side down along with the increasingly impressive Ben Rees (41) and between them they pushed the score into the 90's before Rees fell victim to a reflex catch by Harris at first slip. Sean Marnick was caught impressively at gulley by Harvey whilst Ben Thomas added 16 before Ashton struck again with his second stumping of the game. A quickfire 13 from David Buey bought additional batting points closer but it was down to Alex Tucker (6 No) and Liam Westwater (3 No) on his senior debut to ease the score to 151 for 9 at the close of the innings. For the home side Williams (15-5-28-5), Harvey (8-1-43-2) and Corner Snr (10-1-38-2) were the pick of the bowlers. Eastham were out of the blocks quickly putting Moxley to the sword in his second over for 22 runs and only 4 overs into the innings the total had reached 45 without loss. This early onslaught would prove to be decisive. Sound fielding performances have been a feature in the side this season but a couple of dropped catches, a series of fumbles and a general lethargic performance would cost the visitors dearly. Corner Snr (28) was the first wicket to fall, Thomas keeping a cool head running him out with the score on 53. Thomas was then the bowler when Tucker caught Griffiths (39) and Hooks was caught at deep 'Mid On' by Buey off the bowling of Rees. Harris was gungho in his approach and lucky not to given out a couple of times but his 19 not out was enough to see the home side reach the target and claim the 25 points. Rees (12.2-3-64-2) and Thomas (5-0-33-1) were the Old Parks wicket takers. Team: Brannon+, Marnick T, Rayner, Moxley A, Rees, Marnick S, Thomas, Buey*, Cotgrave, Tucker, Westwater. After heavy overnight rain and frequent downpours throughout the morning it was a sterling effort by the groundstaff to get the pitch ready as many games across Cheshire fell foul of the weather. By 1400 however the sun was shining and Wistaston, winning the toss, elected to bat. The visitors made a solid if slow start due to a tight spell of bowling by Ben Rees (11-1-24-1) and Stew McEwen(15-2-45-3) . The wicket of Aspinall fell when Sean Marnick took a superb catch at 'Mid Off' and the second quickly followed when Mike Hitchell, keeping wicket, caught Cunningham off the bowling of McEwen. With Old Parkonians looking to avenge their defeat from earlier in the season the ever reliable McEwen added two more wickets in quick succession, bowling Brown and the stumping of Ridgeway by the ever alert Hitchell. A change of bowling saw John Orr (8-1-26-1) follow up last weeks effort with the wicket of the remaining opener Parkinson (30) and Mark Rayner (5-2-8-3) cut through the tail including a two wicket maiden. 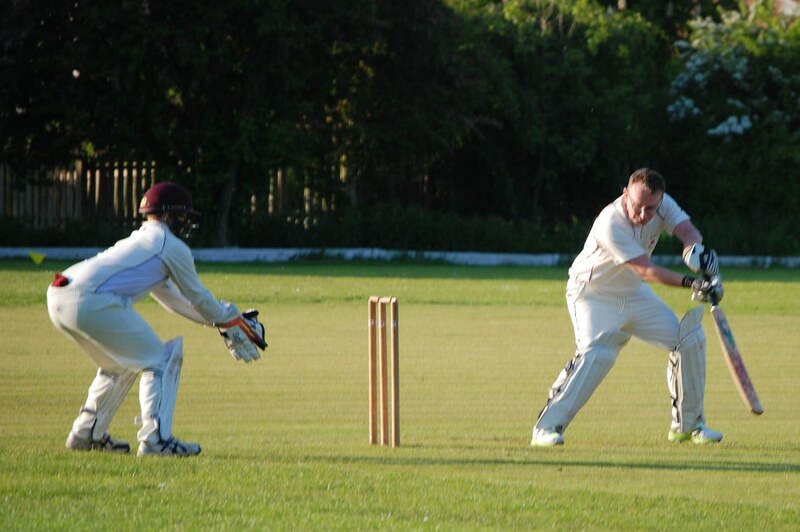 Sam Cotgrave (1.3-0-4-2) capped a fine performance in the field with the last two wickets, both 'caught & bowled' to leave Wistaston 112 all out. The covers went on at the tea interval and it proved to be a wise decision as once again the heavens opened. Old Parkonians also found runs hard to come by and were rocked by the early wicket of Orr with just twelve on the board. Dave Roscoe (22) and 'Man of the Match' Mark Rayner (30) steadied the ship and Rees added a quick fire unbeaten 33 to take the home side within touching distance of victory. David Buey (8 no) joined Rees in the middle and between them they edged the home side past the required total to record a fine win. Brown (15-3-34-2) was the pick of the bowling for the visitors. Skipper Buey reflected afterwards "It was a great effort to get the game on at all and this win, well desreved and a long time coming, was just reward to those that made it possible"
Old Parkonians batted for the full 45 overs scoring 125 for the loss of nine wickets at Holm Lane. 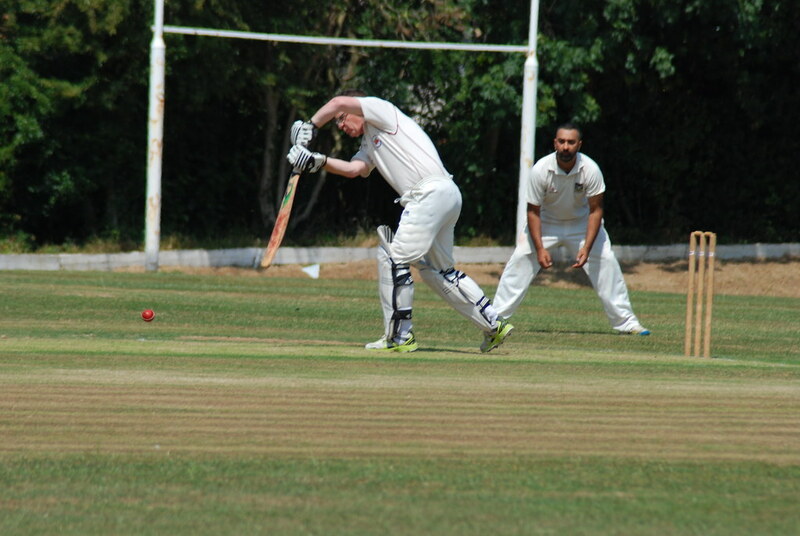 It was a familiar tale as they found runs difficult to come by against the Mossley 1st XI. 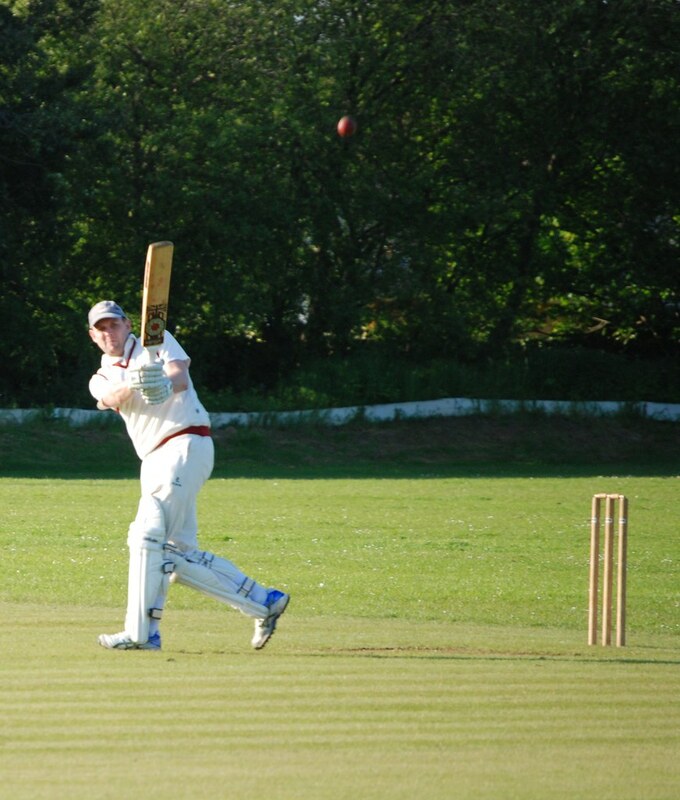 John Orr (21), Dave Roscoe (15), Terry Marnick (14), Mark Rayner (18), Sean Marnick (17) and Ben Rees (27) all made good starts but were unable to capitalise and go on to make a big score on what was a decent batting track. Highlight of the innings was Rees scoring 4, 6, 6 off 3 consecutive balls as he tried to push the score along in the closing stages. For the visitors Brown (15-3-37-4) and Riley (15-5-25-2) were the pick of the bowlers. In reply Mossley reached their target with little fanfare. Stirk (45) and Barber (53 NO) put on 77 for the first wicket and the lack of a strike bowler was once again an achilles heel for the home side. John Orr took the wicket of Stirk courtesy of a fine catch by Rees at Cover Point but it was to be a consolation as Moss (24) and Barber saw the visitors home with 10 overs to spare. Next week the 2nds host Wistaston 2nds and will be looking to address this losing streak. Hartford, on winning the toss, put the home side into bat on what was initially a sunny afternoon at Holm Lane. Andy Moxley (19) partnered Graham Moxley (15) in opening the batting and the pair got off to a decent start before falling in quick succession. 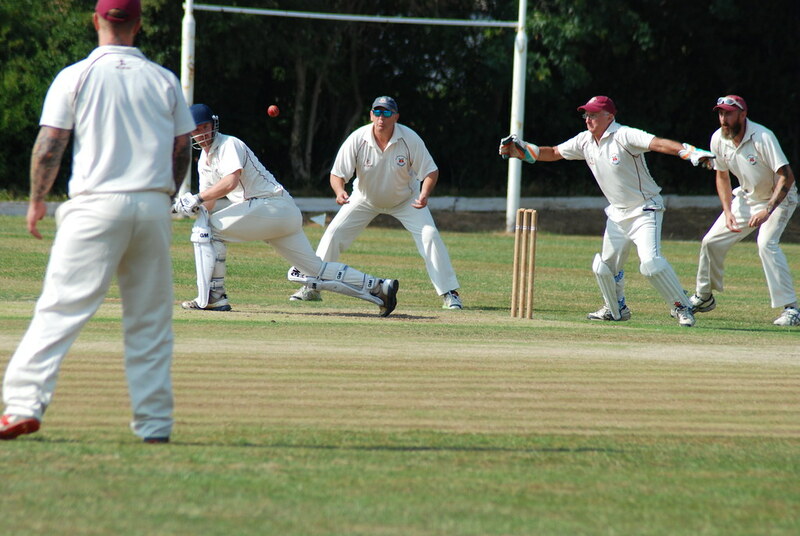 Terry Marnick added 13 including a six before falling to the slower ball that saw him caught at short mid-on. 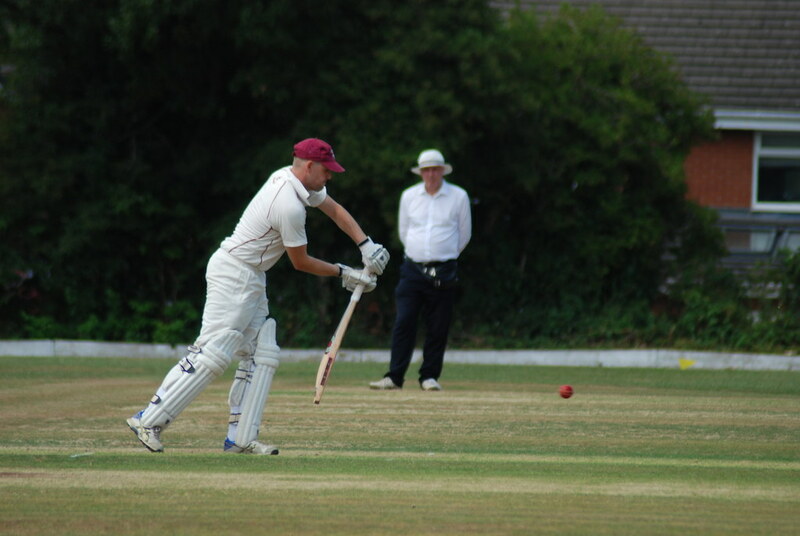 Mark Rayner was making good progress for his 23 but fell foul of a ball that kept low and at the tail Pete Bradshaw frustrated the visitors with an impressive unbeaten 22. Young Spencer Davis and Sam Cotgrave both continue to grow in confidence and occupied precious time in the middle. 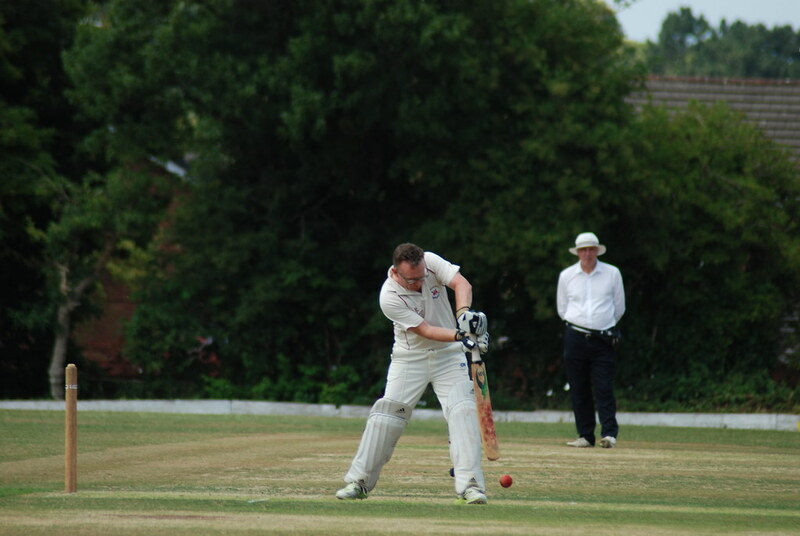 Cotgrave was run-out by a superb throw from Hodgkinson. Old Parkonians reached 120 before Stew McEwen was bowled with just 3 balls of the innings remaining. For the visitors Hodgkinson (3-32), Prateek (2-42) and Whittle (4-38) were the only bowlers used. With the clouds gathering and the imminent arrival of rain very much on their minds Hartford looked to chase down the target from the off. Openers Whittle (48) and Sharpe (40) endured a rain interrupted opening spell before Sharpe was run-out by the quick thinking Andy Moxley. Hodgkinson came the crease but his impact was short lived when Adam Winstanley took a great catch on the boundary at long-on. Sykes was next to go caught by Marnick at square leg and Whittle was then bowled by Moxley for the fourth wicket. As they rain once again started to fall and despite another great effort in the field the visitors reached 121 with overs to spare. Cotgrave (2-39) and Moxley A (1-19) for the home side. After heavy rain in the proceeding 24 hours the sun shone brightly at Capenhurst as the seconds looked to bury the ghost of the opening day of the season when they were skittled out for 34. Old Parkonians were put into bat and found scoring runs difficult on a lively wicket. John Orr kept up his run of form with a steady 25 before being caught at mid wicket and Sean Marnick followed up his innings last week with a disciplined 22 and is surely due a big score. These were the only notable contributions as the visitors long tail was exposed with Adam Walkling taking 4 for 8 for the home side and the visitors being restricted to 72 all out. Young Sam Cotgrave opened the bowling for Old Parks and despite his first three balls going for wides he went onto bowl 6 overs for 21 in what was a superb spell, his best of the season so far and deserving of a wicket. Stew McEwen took two wickets including that of Walkling who, looking to chase down the total quickly hit 18 from 4 balls before being caught superbly by Orr at long on. Mark Rayner displayed a safe pair of hands again taking a very good boundary catch for the second wicket giving McEwen figres of 2 for 40 off 8.2 overs. Another notable performance was that of Spencer Davis, also one of the clubs youngsters, who bowled a fine spell of spin. 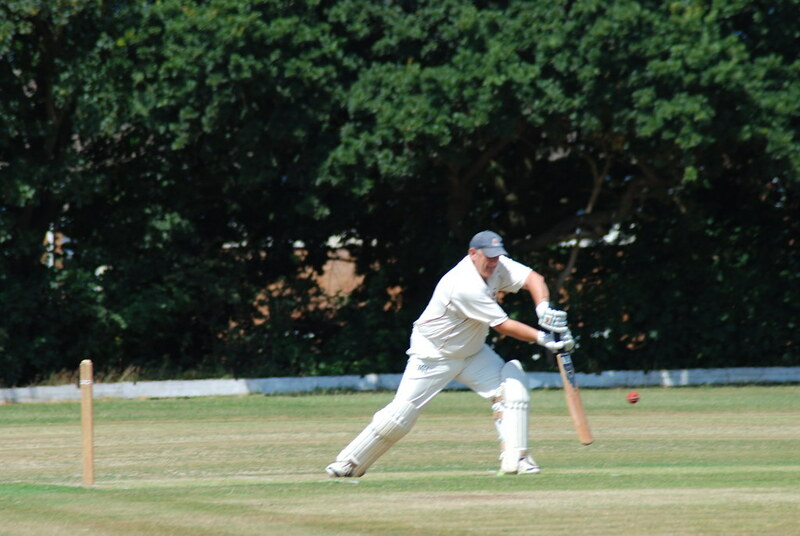 Capenhurst reached the target with 8 wickets in hand to record the double over their guests. On the plus side and despite the defeat the effort and application in the field is very encouraging. For the second week running we were pitched against a team at the top of the table this time away at Port Sunlight. Given the overnight rain and the constant drizzle throughout the morning the wicket was surprisingly firm although the outfield was wet. We won the toss and opted to bat. Carl Brannon battled through for a fine 56 before falling LBW to what would be the first ball of a hat trick with David Buey (Bowled) and Mark Rayner (LBW) the other victims. Sean Marnick played well for his 29 but the only other notable score was 15 from Ben Rees. Our innings closed on 126 from 36 overs. The home side got off to a solid start and it was clear early on that it would be a tough task to restrict them. Stew Mc took two wickets one of them courtesy of an outstanding catch from Jordan Langton who covered a lot of ground running in from the boundary before diving full length and clasping both hands around the ball. It was as good a catch as you would see anywhere in any game. Victory was secured by Port Sunlight in the 17th over despite another decent fielding performance in difficult conditions. 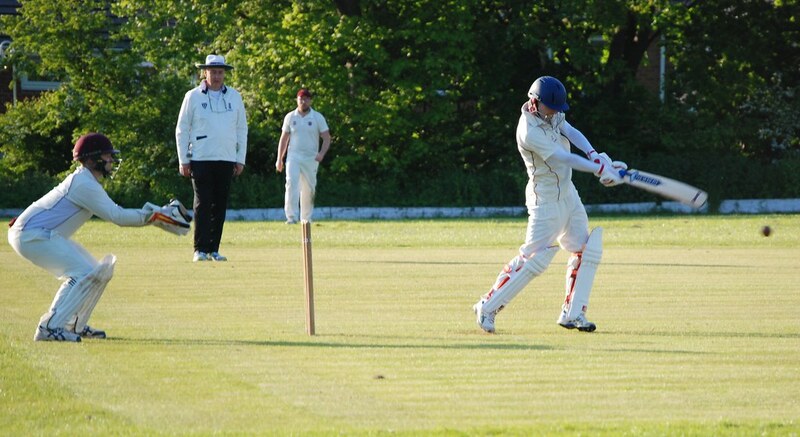 Once again it was a case of 'oh so close' for the 2nd's at home to table topping Mellor. 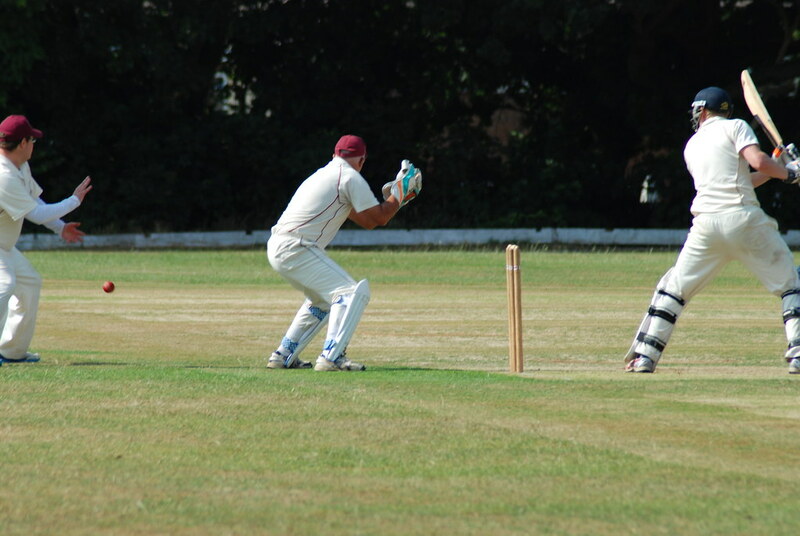 The visitors, unbeaten so far this season, were put into bat and accrued 180 for the lost of 3 wickets in their 45 overs. Both their openers recording 50's despite some superb bowling from Stew McEwen who returned figures of 0-32 from his 15 overs. It was as good a performance that we have seen from any bowler to date this season despite not taking wickets. Ben Rees took two wickets for 51 in his spell of 15 overs and Sam Cotgrave produced a fine piece of fielding for a run out and the third wicket. In reply we reached 162 for 8, our second highest score to date. Ian Smith making only his second appearance recorded a maiden half century before being superbly caught in the slips and Myles Allen batted superbly reaching a relatively quickfire 40. The pair put on 51 for the fifth wicket and with them both at the crease the run chase was on but it was not to be and the home side consolidated and settled for a very good draw. Well, we’re a third of the way through the season already. I don’t know about you but it’s flown by for me which is even more surprising given the poor weather we’ve had to endure – 2½ sunny Saturday’s (not that I’m counting). Both the 1st XI and 2nd XI have had games cancelled because of flooded grounds or rain on the day itself. More home games would have undoubtedly been cancelled if it wasn’t for the hard work and dedication of all those that work on the ground throughout the week and on a Saturday before the game itself, in particular Dave Westwater, Ted Kearney and Chris Beckett. As far as performance is concerned there’s been better starts to seasons. The 1st XI currently lie 3rd from bottom of League 1 though there is bit of gap appearing between them and the bottom two. I’m sure a slight turn round in performance, commitment and luck will see them moving up the table. For the 2nd XI it’s been a less successful start. Dean Dunwoody had to step down as captain early on because of work commitments. I guess making your first £ million does take excessive amounts of time and effort – I should know! Anyway, thanks to Dean for stepping up for the 2013 season and trying to continue through to this one and the work he’s put in, especially in bringing on the youth by ensuring there were plenty of opportunities for them to progress into open-age cricket. Dean’s resignation opened a window of opportunity for our very own born leader of men (and ladies) in the form of Dave Buey to step up to the plate and captain the 2nd XI. He’s really alright for a ‘suvener’. In the few weeks Dave’s been in charge he’s shown how committed he is to bringing on the 2nd XI and the Club as a whole. Dave’s been willing to take hard decisions and lead by example - and when doing he has had the support of all those concerned. With his experience of administration and volunteering in other sports clubs I’m sure he’ll continue to bring the required enthusiasm and dedication. Our keenness to play a couple of matches, which others would have decided to cancel, has actually costs us points, though not that many, and one could argue that cricket should be played if there’s the slightest chance. In some ways Dave’s and Greg’s job have been made easier than recent seasons as the pool of players from which to select has been overflowing which is of course a great position for the club to be in. The pool has been deepened with a number of new players being introduced (don’t forget about OPAL’s membership incentivisation scheme!). Welcome to all of you and I hope you enjoy playing for OPCC for many years to come. Junior cricket’s organisation is, as ever, in the safe and capable hands of Pete ‘Braddy’ Bradshaw. Unfortunately the weather has had a major impact on coaching and practice sessions and games. I’ll leave it to Braddy to provide his usual timely and comprehensive update on the juniors’ season so far. But I’ll just add that as far as juniors’ participation in open-age cricket is concerned we are making progress and so too are the individuals, with a good few playing regularly in the 1st and 2nd XIs. And I’ll just want say a big thank you to the coaches that have been attending when sessions have taken place and appeal to those that haven’t to make an effort to do so. I hope you have enjoyed reading this update. If you have any ideas about how to improve the running of the Club and the playing aspects then please do not hesitate to speak to me or any of the Committee. As you are aware nets has been going for a couple of months now and thanks to all those who have been attending. It's been a particularly good turn out for U15s at the later session and of course for the main junior session. Thanks to all the coaches for their continuing efforts - it's much appreciated. There's two more nets' nights left and I urge you, again, to make the effort to attend - you need to! It's a busy Easter weekend with the First XI away to Stalybridge and the Second XI at home to Capenhurst. Please let either one of the captains (Greg and Dean) know if you are available and if you've an acquaintance who could play. Because of the rugby Cheshire Plate final taking place on the same day it is vital that the captains know who's available. The Cricket Club extend our Good Luck wishes to the Rugby Club in their final. The following day, Easter Sunday, we'll be holding our annual Social Event, and I hope to see you all there with wives, girlfriends (or both), boyfriends, husbands, children, siblings, other relatives, neighbours etc. We need a rough idea of numbers for the day so could you let it be known to any of the Committee if you are planning to attend. There will be the usual mixture of activities and as it's happening later in the year than in the recent past we'll try to arrange suitable outdoor activities which will, of course, be weather-dependent. Please make an effort to attend as it provides a good start to summer socialising and can raise important funds for the Cricket Club. I look forward to seeing you at the remaining nets. Yes, a new cricket season approaches and hopefully a change in the weather too!! Adult cricket nets have already started and take place at Birkenhead Park CC Indoor Cricket School on Monday evenings between 8 and 9pm. All players aged 13 and over are most welcome, including new players who would like to join the club; you will be made to feel most welcome. Junior cricket nets commence at the same venue on Monday 10th March(7-8pm). Indoor nets as already mentioned will run up to and including Monday 14th April.Outdoor nets will commence as soon as possible after Saturday 12th April further notification of this to follow nearer the time. The adult league. 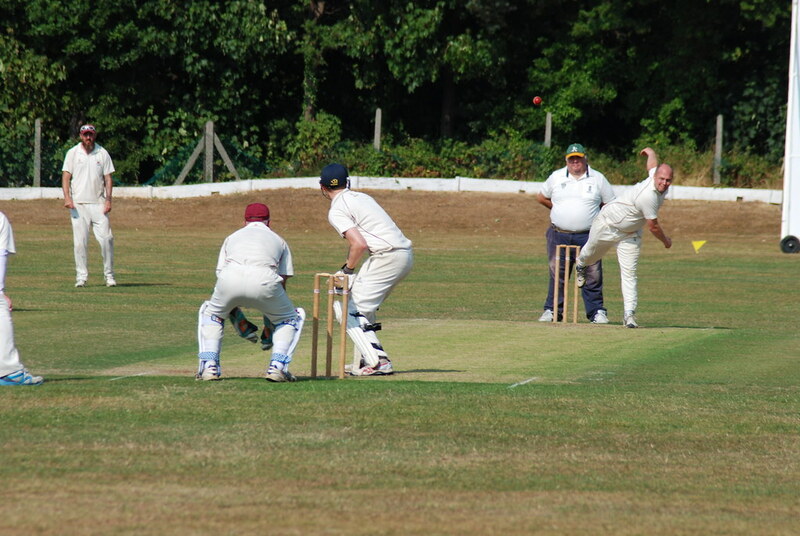 cricket season runs from Easter Saturday 19th April to Saturday 13th September. All these fixtures along with friendlies and junior fixtures will appear on the website shortly. As already mentioned we are really keen to recruit new cricket players of all ages. We are looking forward to an enjoyable and successful season. Richie Beckett. Fixture Secretary/President. Old Parkonians CC.